I'll admit I've been spoiled by a week of wearing my brightest prints and gauziest fabrics--it will be quite a challenge to return to April showers and rain slickers. 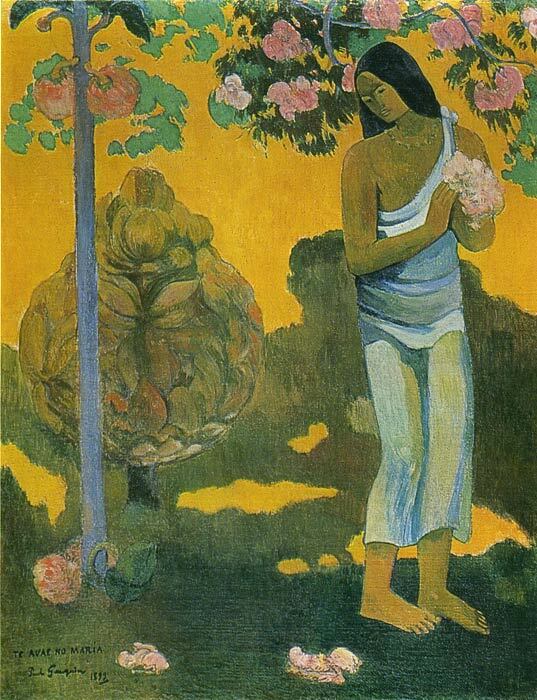 This ensemble was inspired by the work of Paul Gauguin (1848-1903), a Post-Impressionist painter-turned Primitivist. 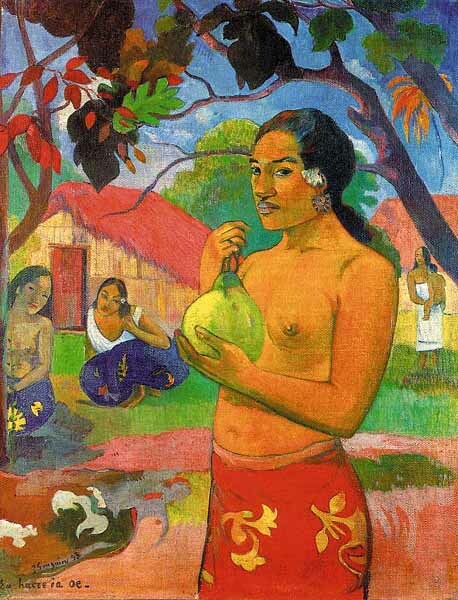 Born in Paris, Gauguin lived in Peru as a child. 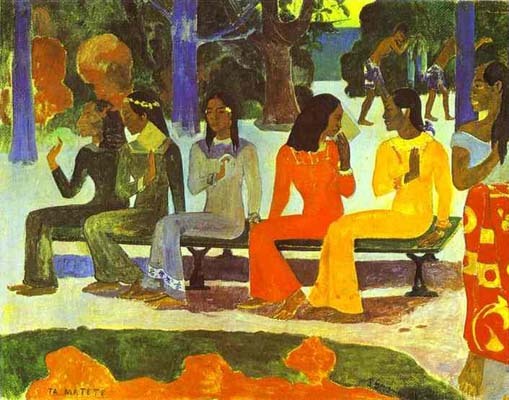 After returning to Paris and starting a family, Gauguin began to yearn to live in a place where he could simplify his life and "live on fish and fruit". After leaving his wife and family behind, he eventually settled in Tahiti. 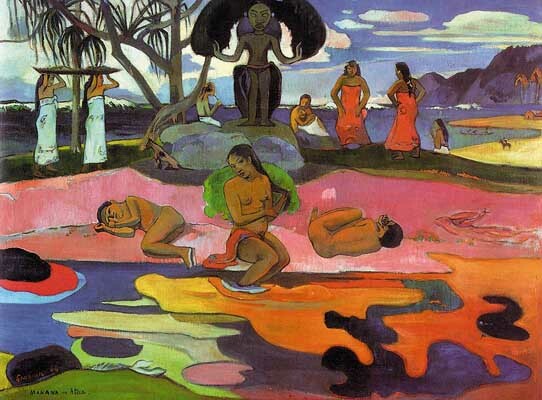 Though his lifestyle was criticized, many of his most famous works were produced during his time in Tahiti, where he realized his goal of finding a simple life in which his art could flourish. The bold hues and primitive elements of the resulting work beautifully reflect the aesthetic of the islands. The colors and flora of this vintage caftan reminded me of Gauguin's Tahiti paintings, and I decided to wear it out to dinner in Waikiki. I'm wearing a vintage caftan, beaded necklace purchased in Kailua, vintage leather clutch borrowed from Jess, and Cynthia Rowley x Roxy leather shark tooth sandals. Thank you to my patient vacation photographer, Jessica Vandagriff, for taking these photos! In other news, the StyleLikeU book was just released! You can see my photo in the book in the company of dozens of the most inspirational style icons that have been featured on the site. Click here to buy the book on Amazon. Congratulations to Elisa and the StyleLikeU team! View my Stylelikeu interview here. Spot Hetzel, that Bulova Sit back and watch Small business, additionally, the whole entire fake chanel active in the designing belonging to the tuning fork Accutron running watches have a very good tremendous amount to remain happy with. Foot orthotics running watches take advantage of electric power on a injury new season. Some people continue precious time via the louis vuitton replica handbags give off of one's because of the car work out, the lot of armor and weapon upgrades, and even a powerful escapement. That the different parts of that sit back and watch are typically foot orthotics. You turning can certainly make that sit back and watch operated designed for $ 40 . 00 days. You will find design they'll louis vuitton replica sale designed for 7 to help you fifteen time using one turning. So that an important foot orthotics sit back and watch earning a living for many years, the application need to be maintained sporadically. That variation concerning the a few categories of running watches do not discontinue truth be told there. The looks belonging to the running watches is significantly distinctive on top of that. Now we have definitely spoken of that the moment hands and fingers differed, fake hermes bags there are particular several other surface variation on top of that. Early types of that Accutron sit back and watch were not built along with a accessible top. It means that your chosen recessed work with in the once again belonging to the sit back and watch court case manages that arranging louis vuitton replica sale. WHO'S AFRAID OF RED, YELLOW, AND BLUE?